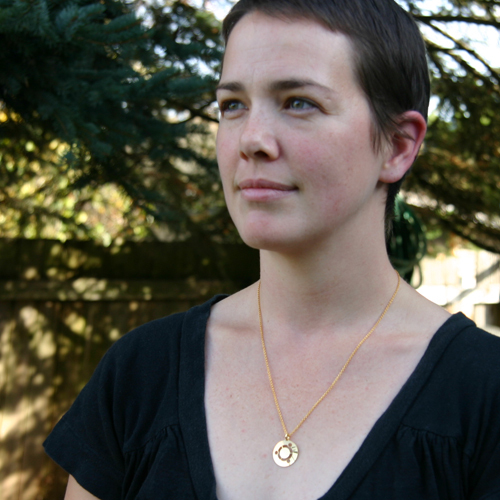 Partimus Blog › Beautiful new Ubuntu necklaces in time for the holidays! Partimus co-founder Maile Urbancic has outdone herself again. As we blogged about here, Boutique Academia, a small company run by Partimus co-founder Maile Urbancic, has created some beautiful gold-colored and silver-colored earrings created in the shape of the Ubuntu human family logo. 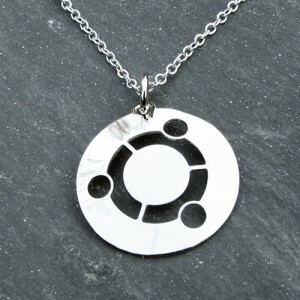 Now, she has added gold-colored and silver-colored rhodium necklaces with the Ubuntu theme. We are so proud of these earrings necklaces, because they are beautiful, and they promote the Ubuntu theme of one human family. Partimus’ work in schools is about delivering high-quality pre-owned computers to students, but the bigger picture is teaching students and teachers about the power of sharing. The Ubuntu human family logo fits right in with this theme, so Partimus is certainly thrilled to be able to be associated with this wonderful theme, and these beautiful earrings and necklaces. A close-up of the silver-colored necklace. We are also thrilled to be able to show our major donors that we are making headway in our goal of growing Partimus as an organization. Major donors are always happy to see that the organization they support has multiple sources of revenue, so that the organization is sustainable in the long run. Thanks to Maile for starting this fundraising campaing, and thanks to all of the Partimus volunteers who are publicizing the campaign and are making it a success! And of course, thanks tons for all of you wonderful donors who purchase a set of earrings or a neckace! Partimus is a registered 501(c)(3). All donations to Partimus are tax deductible. Our Donations Page is here. Donations will help us advance our mission of placing computers in under-privileged schools. This was written by Christian Einfeldt. Posted on Tuesday, November 13, 2012, at 4:13 am. Filed under News. Tagged Boutique Academia, earrings, fundraiser, Maile Urbancic, necklace. Bookmark the permalink. Follow comments here with the RSS feed. Post a comment or leave a trackback. ‹ Board Members Beth Lynn and Elizabeth are going to Ghana!